Electricity Minister A.K. Balan inaugurated the Poozhithodu mini hydro-electric project, near Peruvannamuzhi here, on Saturday.The hydro-electric project with 4.8 megawatt installed capacity was completed at a cost of Rs.32.79 crore. In his inaugural address, Mr. Balan said three major mini-hydro-electrical projects were commissioned in the Nadapuram Assembly constituency in this tenure of the Left Democratic Front government. The constituency would be declared totally electrified in a week, he said. The work on the Poozhithodu project, at the confluence of Illyani and Kadanthara rivers, began in March 2009 and it was completed 20 months. The government had acquired 20 acres of land from 10 private land owners for the project. 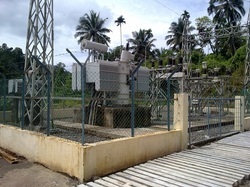 The electricity generated from the power house of the hydro-electric project will be transmitted to Kuttiadi sub-station through a 14-km electricity line.The project, likely to benefit the entire Malabar region, has a concrete check-dam of 59 metres across the Kadanthara river at Mavattom, near Pashukadavu; a 775-metre-long canal, 2200 cubic metre capacity forebay tank on the valley of Ekkan hill; steel penstock pipes for 126 metres; power house and switch yard. The water used for power generation will be diverted back to the river.The electricity from this project passing via Poozhithodu-Kuttiyadi 33-kV Double Circuit (DC) line and received at the existing 110-kV substation at Kuttiyadi and distributed. THIS SITE IS CREATED BY NITHIN & TOMLIN KAITHAKULAM POOZHITHODE.